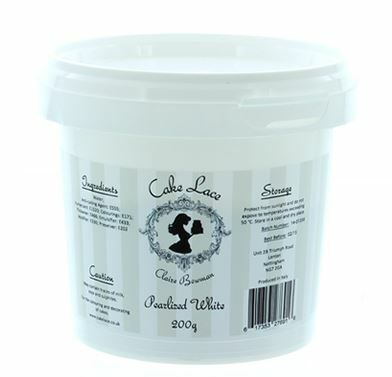 Pre-mixed Sugar Dress Pearlised White Cake Lace 200g by Claire Bowman. Pre-mixed cake lace is little bit stiffer than the mix it yourself original Sugar Dress/Cake Lace when spreading it over your Sugar Dress mat. 200g is the equivelant to 7.05 oz. Product is intended for use on spreadable lace mats. Additional shipping charges may be needed.